You're checking out a simple and user friendly reflection form for all things related to TPGES. 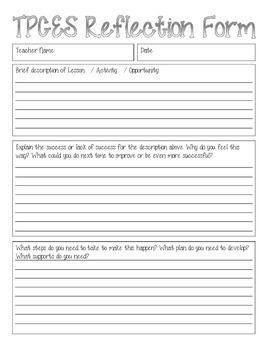 If you've completed a lesson, a unit, a project, a leadership activity, or a professional development, use this form to provide a reflection of your activity. This form would be outstanding evidence in Domain 4 (Professional Responsibilities) in TPGES. One form is a PDF form and one form an an EDITABLE form where you can type in the text boxes. Please stop by "Principal Matters" to check out my other products, especially those related to TPGES! Thanks for looking!